In March of 2013 we made our first trip to Austria together. Right when the plane touched down in Salzburg, we felt an overwhelming amount of appreciation for the country and its people. There was a zest for life that we had lost track of living in Washington DC, focusing on our careers so intensely. The value of tradition and true appreciation for the world are so deeply rooted in the Austrian culture. We wanted to learn from them. Bring those admirable qualities into our own family. As the days went on during that first trip in 2013, and as we fell more and more in love with Austria, we realized that following through on this new-found dream had to be our primary focus after marriage. Living abroad would allow us to grow both as individuals and as a couple. It would change our future for the better. We were motivated, passionate and ready to take this on. 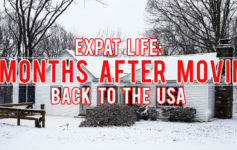 A year or so later, after we got married, it was time to turn our dream of living abroad into a reality. There was a lot that needed to happen of course, but we decided to take it one step at a time. First up: a MAJOR apartment clean up and purge. Magnets, pictures, postcards, old receipts and coupons scattered everywhere. Cleaning this up seems like such a minor task, but it represented a new point in my life. Where I take action instead of dwell on things. Where I listen to myself, set goals and accomplish them. It bothered me every time I walked by. Every time I went to grab something out of the fridge. And ridding its surface of clutter seemed to be a great start to our clutter-free future abroad. As I began to reorganize, I started thinking. We look at this fridge every single day, multiple times a day. Why not use it to keep us motivated? 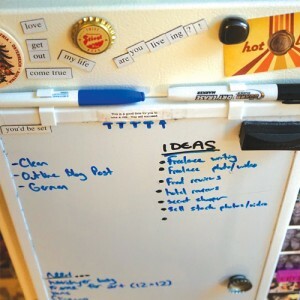 How can one transform a standard fridge into a form of inspiration or vision board, you ask? It’s no longer just a place to keep your food fresh, it is now a blank canvas for anything and everything that makes you happy and keeps you going. So we got a small magnetic white board for ideas and to dos, filtered through our word magnets to find the most powerful phrases, looked through our pictures and went to town. It is crazy how much excitement and happiness I felt from such a minor task. It allowed me to refocus. What truly makes me happy? What do I want in life? Everything from post cards of places we’ve explored to funny magnets that remind us to laugh when times are tough. Taking a second to create a vision board on our fridge allowed us to step back, and remember what we are working towards: a life move to Austria! 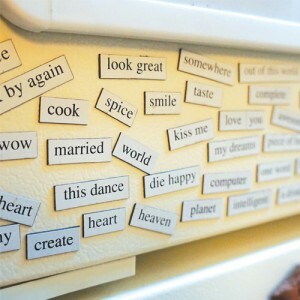 So yes, in a way, I am literally telling you to create a collage with magnets on your fridge, but more importantly, I want to emphasize the value of finding inspiration everywhere you look, even in places you would’ve never thought of previously. So other than decking out your fridge, how else can you constantly remind yourself of your hopes and dreams for the future? How can you stay focused, happy and appreciative? Purchase a 12-month calendar of the places you wish to explore. Create a scrapbook of images and phrases that keep you focused on your dream. Watch travel shows so your curiosity is always sparked. Find a quote that really speaks to you, print it out and throw it on the fridge. Next Article Getting over the FOMO and living for YOU!